videos, photos, and first-hand reports! "It is a sword that heals." We came across those words midway through the Do the Right Thing Tour, during our stop in Atlanta. "Non-violence is a powerful and just weapon. It is a weapon unique in history which cuts without wounding and ennobles the man who wields it. It is a sword that heals." This quote -- and the tour of which it was a part -- had a powerful impact on the crew from Immokalee. It filled us with renewed energy and enthusiasm after a week on the road, cast our struggle with Publix in a penetrating new light, and provided a stark new outline for our reports from the road the rest of the way. 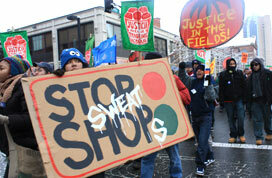 Fair Food activists picket a Washington, DC, area Giant supermarket during last November's Supermarket Week of Action. Giant is one of Ahold's two major US brands. Ahold also owns Stop & Shop. At a glance: Florida farmworkers have long faced brutal conditions in the fields, including sub-poverty wages, widespread labor rights violations, and even modern-day slavery. Today, however, there is hope on the horizon, thanks to the efforts of farmworkers, Fair Food activists, Florida tomato growers, and nine food industry leaders who have joined in support of the CIW's Fair Food principles, including a strict code of conduct, a cooperative complaint resolution system, a participatory health and safety program, and a worker-to-worker education process. But Publix and Ahold are refusing to do their part, and if they have their way, the unprecedented farm labor transformation promised by the CIW's landmark agreement with the Florida Tomato Growers Exchange would be significantly diminished. Farmworkers' hopes for an end to the decades-long "Harvest of Shame" would be dashed. Publix founder George Jenkins used to say, "Don't let making a profit stand in the way of doing the right thing." The people who are running Publix and Ahold today have taken Mr. Jenkins' wise counsel and stood it squarely on its head. "We don't have any plans to sit down with the CIW," Publix's Media and Community Relations Manager Dwaine Stevens said, also citing that the company sells around 36,000 products in the stores and it cannot get involved with each product's labor issues. "If there are some atrocities going on, it's not our business. Maybe it's something the government should get involved with." "On November 16, the Florida Tomato Growers Exchange, which represents all of Ahold's major tomato growers and suppliers, announced an agreement with the CIW to accept the CIW's Fair Food Code of Conduct... We will not, therefore, participate with the Growers' employees in CIW's proposed penny-per pound program." "Don't let making a profit stand in the way of doing the right thing." George Jenkins, founder of Publix, as quoted by Ed Crenshaw, Publix CEO, to Tampa Business Journal, in the February, 2010 interview entitled, "Doing the right thing a top priority"
Sub-poverty Wages: Workers are paid virtually the same piece rate (an average of 50 per 32-lb. bucket) as they were 30 years ago. At this rate, a worker must pick over 2.25 TONS of tomatoes to earn the Florida minimum wage in a typical 10-hour workday. Most workers earn less than $12,000 per year. Denial of Fundamental Labor Rights: Farmworkers in Florida have no right to overtime pay, no health insurance, sick leave, paid vacation or pension, and no right to organize in order to improve these conditions. Modern-day Slavery: In the most extreme situations, workers are forced to labor against their will through the use or threat of physical violence. Since 1997, there have been nine cases of forced labor prosecuted in Florida's fields, involving over 1,200 workers. These conditions -- and more, including widespread sexual harassment and wage theft -- are the "atrocities" to which Publix spokesperson Dwaine Stevens was referring in his statement (above) to the press in December of last year. But today, for the first time, there is hope for real, durable respect for human rights in Florida's fields. Indeed, thanks to the combined efforts of thousands of workers from Immokalee, tens of thousands of Fair Food activists across the country, several of the state's largest tomato growers, and nine multi-billion dollar food industry leaders, we stand today on the threshold of an unprecedented transformation in agricultural labor conditions in Florida. Worker Education: The CIW began educating farmworkers in November of last year on the Fair Food Code of Conduct, their new rights in the fields, and how to report problems that arise. These trainings take place at the company, as part of the work day, so that company support for the new Code is a clear part of the message. Already nearly 2,000 workers have participated in the educational sessions (on right, workers review the new rights booklet distributed at the sessions). Wage Increase: In January of this year, growers began passing on the Fair Food Premium (penny-per-pound) from participating major buyers of tomatoes (Subway McDonald's, Burger King, Whole Foods, etc.) to farmworkers in their paychecks. The penny-per-pound bonus is reflected as a line item in the paycheck that workers can see. Growers will be audited to verify correct distribution of the wage increase. Clocking-in: The Code of Conduct requires a reliable mechanism to keep track of farmworkers' hours and requires payment of workers for all the hours they are on the job. Additionally, in the past, farmworkers normally would get up at around 5 am to be picked up for work at 6 am, only to spend several hours waiting in the fields without pay. Now, pick-up times at one of the state's largest farms have shifted to coincide with the actual start of work, with workers getting picked-up closer to 8 am. Workers no longer have to spend several hours waiting in the fields without pay and are able to get more sleep, while parents are able to be with their children and get them ready for school instead of having to drop them off at daycare at 5 am. No More Over-filling of Buckets: Until now, it was standard practice for workers to have to overfill their buckets-- which meant upwards of 10% of each worker's labor was going unpaid. If they didn't overfill the buckets, they would often not receive credit for the entire bucket. Now, farmworkers need only fill the bucket to the top in order for the bucket to be paid (the image on the right, taken at one of the participating farms earlier this month, indicates the new standard). Report Abuses without Fear: Farmworkers now have the right to report abuses or violations of the Code of Conduct -- to the CIW, to a third-party, or to the farm itself -- confidentially and without fear of retaliation from their bosses. This includes instances of sexual harassment, violence, wage theft, and discrimination. Abuses reported by workers trigger an investigation and enforcement process to fix the problem and hold violators accountable. Already this season several complaints have been reported, investigated, and resolved to the satisfaction of workers who lodged the complaints. These changes -- and more, including shade in the fields and nascent health and safety committees -- constitute the first real, tangible labor reforms in the modern history of Florida agriculture. Taken together, they represent a bridge between a history of shameful farm labor exploitation and a future of more modern, more humane working conditions in Florida's fields. But that bridge may well fall short, thanks to Publix, Ahold, and the rest of the supermarket industry. That's because the solution to farm labor exploitation and abuse contained in the Fair Food principles depends on the participation of all the major purchasers of Florida tomatoes. Each buyer must contribute its fair share -- its penny-per-pound -- for the pay raise to reach its full potential. Each buyer must commit to direct its purchases to those growers complying with the code of conduct -- and away from those who don't -- for working conditions to get better and stay better. The solution is only as strong -- the raise is only as big, the change in working conditions is only as durable -- as the number of buyers that support it. In the words of the FTGE's Reggie Brown, "Everybody in the system has to be invested for it to work." And indeed, the nine leading food corporations that have already signed Fair Food agreements with the CIW are paying into the system and conditioning their purchases on compliance with the code. But those food corporations that have not yet signed -- principal among them supermarket industry leaders, with the sole exception of Whole Foods -- are not. And now it is becoming increasingly clear that the strategy of those supermarket leaders, in particular Publix and Ahold, is to shirk their responsibility to pay into the system, short workers of their portion of the pay increase, and refuse to tie their purchases to the Fair Food principles. 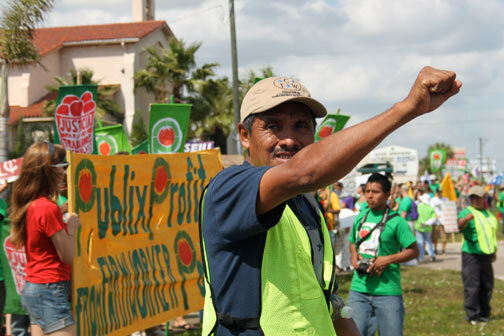 If Publix and Ahold have their way, the unprecedented transformation of farm labor conditions promised by the CIW's landmark agreement with the Florida Tomato Growers Exchange would be significantly diminished. 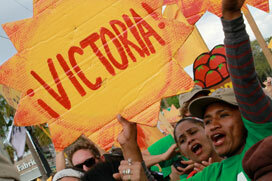 Farmworkers' hopes for an end to the decades-long "Harvest of Shame" would wither on the vine. Such an outcome would be doubly harsh given the active role supermarket giants like Publix and Ahold have played in creating -- by leveraging their volume purchasing power to demand ever lower prices for produce -- the poverty and brutal working conditions from which they have profited for so many years. The people who run Publix and Ahold today are doing the very thing Publix founder George Jenkins warned against so many years ago -- they are letting profit stand in the way of doing the right thing. In fact, they've turned Mr. Jenkins' sage advice squarely on its head. That's why, if you support the Campaign for Fair Food, you must join us this spring for the Do the Right Thing Tour! The victory announced last November in Immokalee is, without doubt, a watershed moment in the history of Florida agriculture. Never before have growers and workers joined together behind such progressive standards and at such a comprehensive level, covering over 90% of the entire Florida tomato industry. We -- all of us -- are making history. But that victory will be undermined if Publix and Ahold are allowed to take the low road they seem so determined to travel. As we assemble to march in Boston and Tampa, let us gather our forces, meet them on that road, and turn them back to join the rest of the food industry on the path to true social responsibility.